Pre-heat a 375 degree oven. You can use the skin from which ever part of the chicken you like. I just thought the thigh part is the easiest to get the skin off. 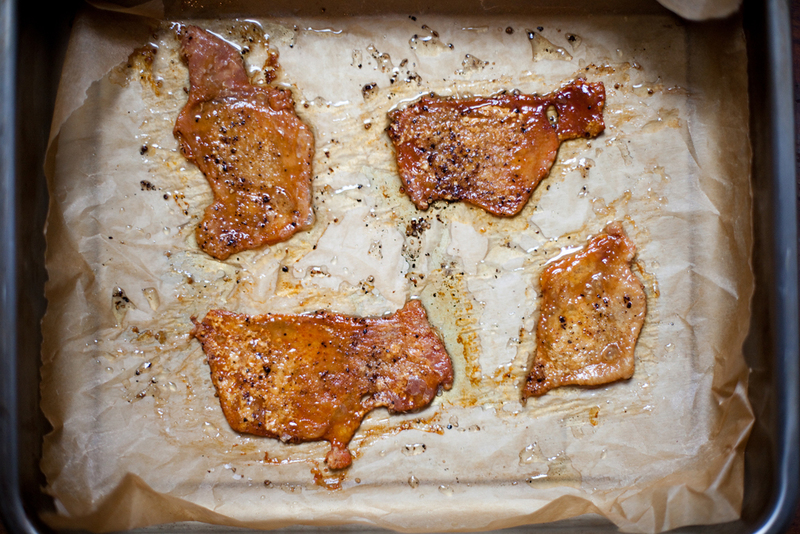 Lay a piece of parchment paper on a cookie sheet or roasting tray. 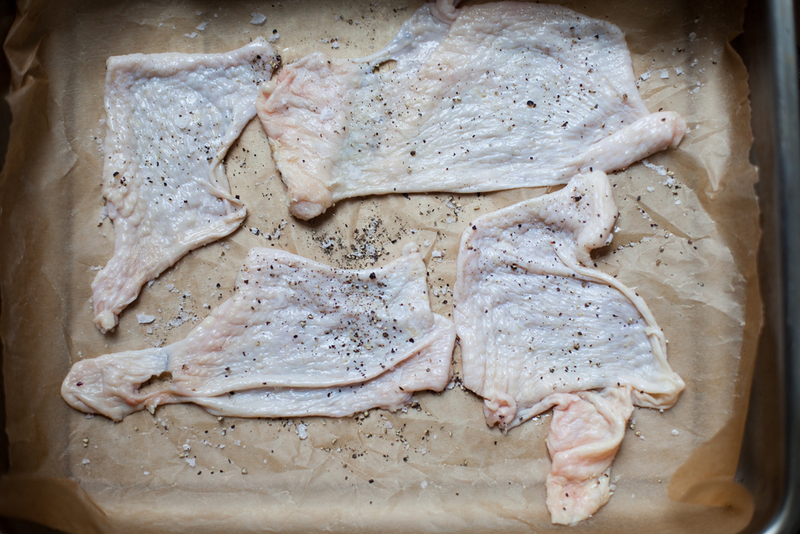 Sprinkle salt and pepper on the parchment paper and lay each piece of skin on the paper. Season the top of the skin with salt and pepper. If you have 5 spice powder around, add a dash to each piece of skin. Lay another piece of parchment paper over the skin. Get another cookie sheet or any oven safe flat things and put it on top creating a sandwich. This is to keep the skin from curling up when baking in the oven. Now bake the skin in the oven for 40 to 50mins. I did mine for 45mins. 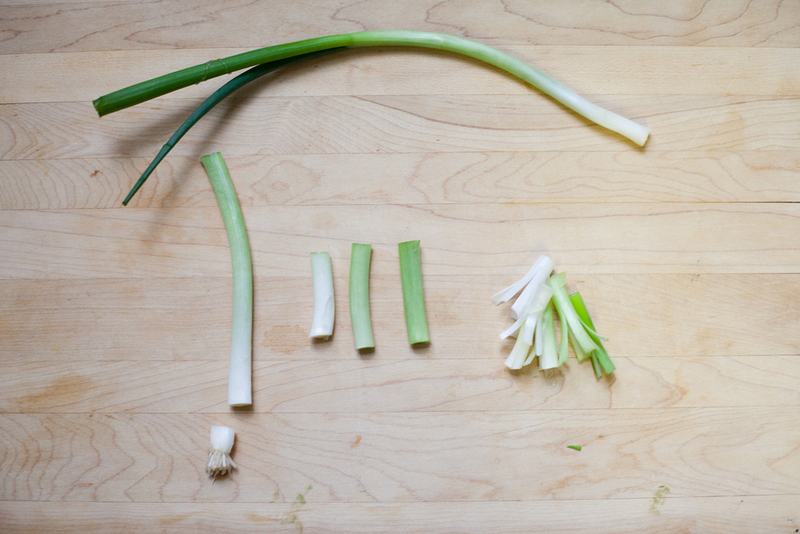 While the skins are baking, wash, dry and cut up the scallions. You can slice and dice them which ever way you like or you can fancy it up like I did and turned them into florets. Or if you want to go the Momofuku way, you can totally use some pickled cucumbers as well. When the skins are done, take them off the tray and lay them on some paper towels to absorb the fat. As for the buns, if you decide to buy your buns frozen, like I did, heat them up according to the package. It takes 10mins to steam them or 3mins in the microwave. If you’re going to steam them, start steaming them 8 or 9mins before the chicken skins are done. Basically you want the buns to be ready around the same time as when the skins are ready. I was lazy and microwaved mine. Time to assemble! 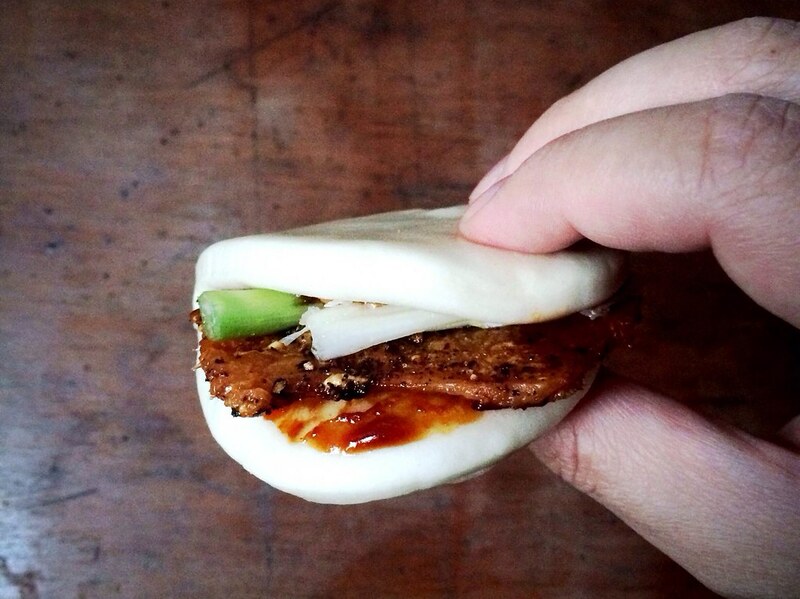 Get a bun and smear some hoisin sauce on the top and bottom part. Add a piece of skin and top it off with the scallions (or cucumbers). Fold the top over and eat.